Washington’s Jack Luebbe hits a return during his second singles match against Miami Trace’s Eli Schirtzinger Tuesday, April 10, 2018 at Gardner Park. Miami Trace’s Eli Schirtzinger is ready to make the volley during his second singles match against Washington’s Jack Luebbe at Gardner Park Tuesday, April 10, 2018. 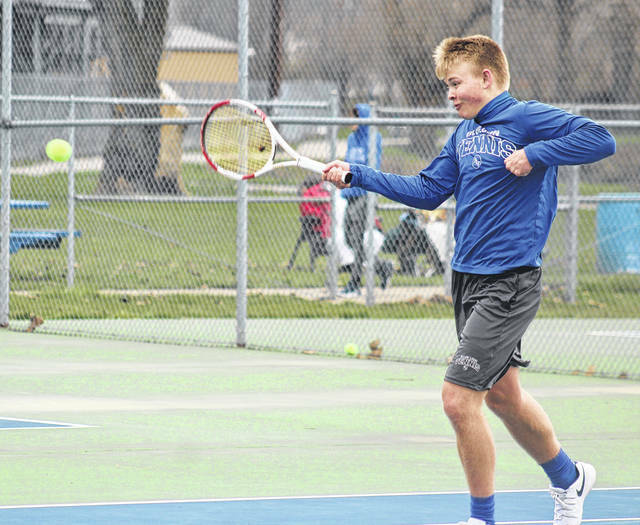 With Fayette County still feeling what we all hope is the last remnants of the winter of 2017-18, the Washington Blue Lion tennis team hosted the Panthers of Miami Trace High School Tuesday evening at Gardner Park. 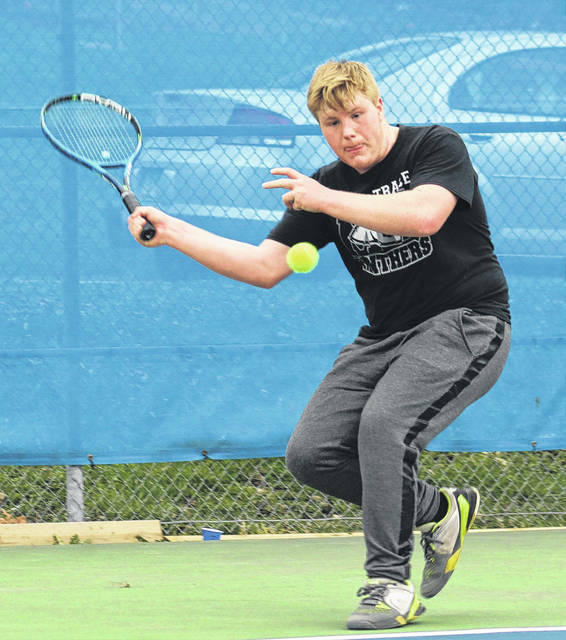 The Panthers won the Frontier Athletic Conference match, three courts to two. At first singles, Matt Fender of Miami Trace beat Jordan Behm, 6-4, 3-6, 7-6 (7-5). At second singles, Washington’s Jack Luebbe defeated Eli Schirtzinger, 6-2, 6-4. Washington’s Grant Kuhlwein beat Nathan Taylor at third singles, 7-5, 6-2. At first doubles, Adam Ginn and Jon Allen of Miami Trace topped Max Schroeder and Maria Pickerill, 6-2, 6-4. At second doubles, Miami Trace’s Paul Natzschka and Isaac Abare beat Blaise Tayese and McKenzie Cress, 6-3, 6-1. In j-v matches, Miami Trace’s Jack Ivers and Ryland Gardner beat Tony Kuenzli and Keiya Satoh, 8-3. In singles, Devin Riggs of Miami Trace defeated Sam Schroeder, 8-0. Miami Trace is now 3-0 in the FAC. Washington is at Logan Elm Wednesday, and Thursday the Blue Lions travel to Jackson. Miami Trace has a non-league match at home against Unioto Thursday at 4:30 p.m.